Dream Pod 9: Utopia Armed Forces Kickstarter - Captain and Commander Reward Levels Preview! The Captain reward level at $70 CAD ($53.85 USD) pledge will be the main reward level for the upcoming Utopia Armed Forces Kickstarter with its initial funding goal of $30,000 CAD ($23K USD). The Captain reward level will include 1x Utopia patch and 18 plastic miniatures army, plus stretch goals to bring that number up to 36 plastic minis when all are unlocked. We also have 2 variants on the Captain level, they are the Veteran Captain level $90 CAD ($69.23 USD) which adds 1x MAR-DK Drone resin model to the Captain reward level package. 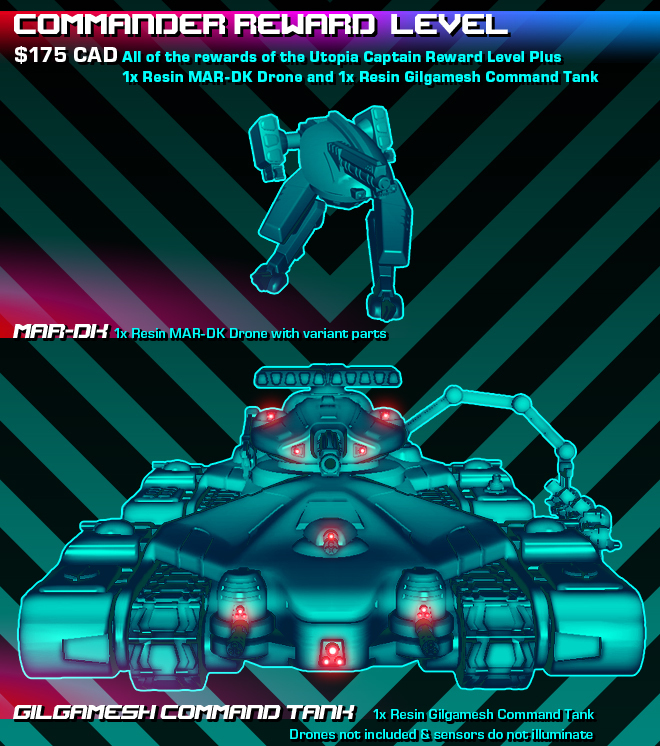 And the Elite Captain level $155 CAD ($119.23 USD) which adds 1x Gilgamesh Command Tank resin model to the Captain reward level package. 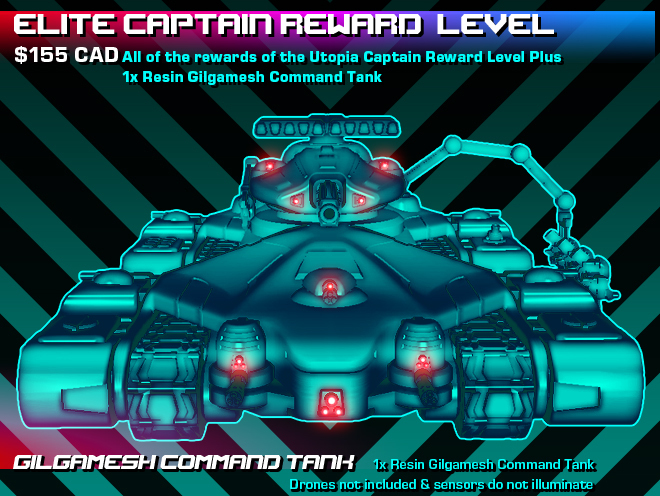 Plus we have the Commander reward level $175 CAD ($134.62 USD) which adds 1x MAR-DK Drone resin model and 1x Gilgamesh Command Tank resin model to the Captain reward level package. See all the Captain and Commander preview graphics attached with this post. Also we'll have a Gear Pilot reward level $6 CAD ($4.62 USD) which includes 1x Utopia patch plus any add-ons selected. And a Cadet reward level $10 CAD ($7.69 USD) which includes 1x Utopia patch and its worldwide mailing cost, but no other add-ons can selected. We'll have a fixed shipping cost for all the reward levels except Cadet based on Backer location that will be charged after the Kickstarter ends and our pledge manager website is open. Next update we'll preview the Hero of Utopia reward level and add-ons available as part of the Kickstarter. Home › Blogs › Robert Dubois's blog › Utopia Armed Forces Kickstarter - Captain and Commander Reward Levels Preview!